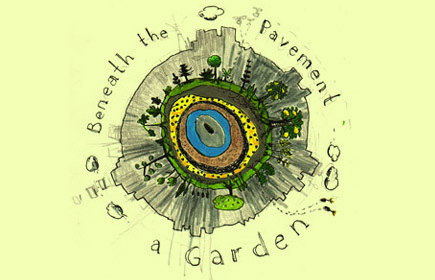 Beneath the Pavement: A Garden is a project that considers biological forms in relation to political and social systems. 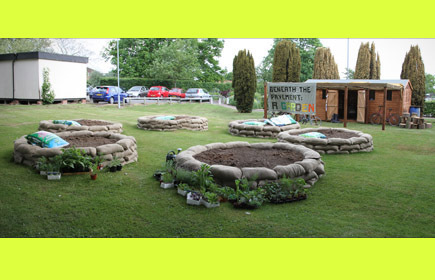 It looks at the potential of a small plot of land on the Loughborough University campus to tell social and political stories, deconstructing systems, planting them and watching them grow. We often inform our economics, architecture, political structures and artwork with systems of nature. What happens if we re-impose these interpretations back onto nature or have them assume roles based on interpretations of these systems? Beginning the project, a three day workshop in May 2010 offered participants the opportunity to collectively debate, design and create edible landscapes based on political systems. With contributions from a diverse range of artists, academics and environmentalists, these discussions informed how the plot has started to develop. 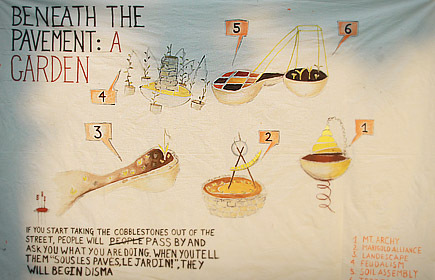 Six socio-political systems arose through the workshops, manifest in the garden’s circular beds. While some systems used techniques from traditional gardening, others questioned natural hierarchies and chose to bridge political systems. Many of the garden beds themselves were deconstructed in accordance with the systems they represented, hierarchical systems developed into spirals, and democratic systems divided plots equally with space for varied types of plants. Over the coming months the garden will act as a meeting place, as participants help tend the land and support this newly created garden to grow and thrive. Further planting will take place and invited speakers will begin conversations as the garden expands beyond its initial boundaries.